1. Heat the oil in a large saucepan and fry the squash and onion for 4–5 minutes. 2. 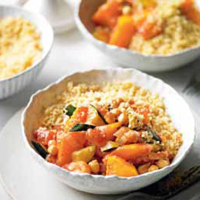 Add the courgette, 2 tsp tagine paste and chick peas and cook for 1–2 minutes. 3. Add the tomatoes, apricots, if using, and 75ml water and simmer for 10 minutes. Season to taste. 4. Meanwhile, place thecouscous and remaining tagine paste in a large bowl with 400ml boiling water, cover and leave for 5 minutes. Fluff with a fork and serve with the tagine.